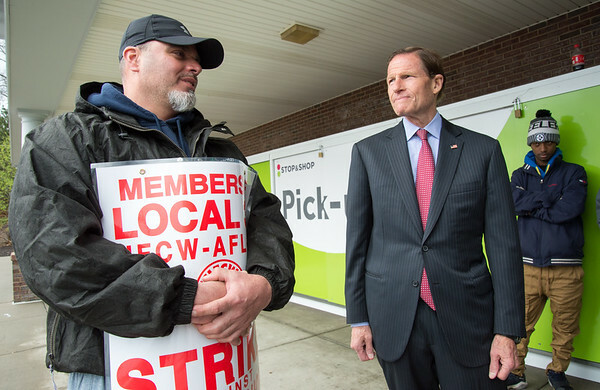 On Monday, U.S. Sen Richard Blumenthal met with striking Stop & Shop workers in New Britain, Bristol and Wallingford. Blumenthal told the workers who are striking that what they are doing is important not only for them, but for other working Americans who face the same goals. Throughout the weekend, Blumenthal has been speaking with Stop & Shop employees and management across the state to ensure the union employees voices are heard. Monday was Stop & Shop workers’ fifth day on the picket line, leaving the stores with no choice but to only offer primary services as well as pharmacy and banking. On Thursday, workers at all Stop & Shop stores in New England walked off the job and were asking customers who tried to enter to the market to shop elsewhere with the hope that they would turn around and not cross the picket line in support of the union. Stop & Shop managers were at stores to keep the markets open, but managers at some other area grocery stores and markets said there has been a slight increase in their business since the strike. Guido Martini, store manager of Price Chopper in Bristol, said the store has seen an upturn in its business in the last few days. “We have been busier but nothing substantial,” Enzo Formica, employee at The Bakery On The Ave in Berlin, said. Other stores in the area told The Herald and The Press that they have either seen just a slight increase or no increase at all in terms of their customer base in the last few days. “We have seen the same people, the same customers,” Cecilia Ferreira, store manager at America’s Food Basket in New Britain, said. Luciano Lastrina of Kensington Market, in Berlin, said he has seen the usual steady line in the last few days. “A little stronger,” he said but mostly the usual faces. Stop & Shop stores across New England are facing the same issue after the union that represents their employees was unable to reach an agreement with the company on a new contract. Employees, who have been without a contract since February, are seeking wage and benefit concessions. Stop & Shop customers went to The Herald Facebook page to comment on the strike and whether they plan to cross the picket line to shop. Most of the comments were in support of the striking workers. Posted in New Britain Herald, New Britain, State on Monday, 15 April 2019 20:35. Updated: Tuesday, 16 April 2019 12:47.